I’ve been reading about Reading challenges and wondered whether I should take part in one. It is a kind of measurement – which I do already, to a certain extent, in that for the last ten years or more I have actually been noting down the titles of the books which I completed. No comments initially, though more recently I have tended to do a little categorization: fiction/non-fiction, a genre, and the date I completed the book. Plus I usually make a note of books with African content or authors. Over the last three years or so, I have “joined” various websites where one can record one’s reading: Shelfari, LibraryThing, CompletelyNovel, BookArmy, etc but have not been particularly diligent in either visiting the sites or updating my profiles there. One I didn’t mention is GoodReads to which I have been much more loyal. If I ask myself why, I would probably say that it is relatively simple, and not particularly jazzy. There are some graphics, but they tend to be either book covers or small photos/graphics of contributors. I can list my books, and make comments on them. I’ve also found a web-based African literature book group – pretty unusual from my searches, which I admit may not have been as thorough as they could or should be. It’s easy to write comments, and others do respond! And more recently I found a couple of interesting (to me) challenges: the 50 books a year and the 100+ book challenge. I knew I would definitely be over fifty, so decided I might as well be overly ambitious and try the second one! So far I think I am on book 5 which is not exactly speedy! But we shall see. I try not to include the assorted cookbooks which I just skim, but I think I should make it. Though a couple of door-stoppers won’t help matters! Since I’ve been on holiday for almost two weeks, I was able to finish a few more books than I would have done if I had been going to work. As usual a mixture of the slightly literary with the slightly less serious…, interspersed with dipping in and out of some cookbooks, though not necessarily doing anything practical related to this. I finally got around to reading Muriel Barbery’s The elegance of the hedgehog – in English though, unlike my ambitious sister who decided to read it in French! I liked it, though I found the ending rather unexpected! There are a couple of works with an African flavour: Chris Cleave’s The other hand [also goes by the title Little Bee in the US?] and Work in progress and other stories. Interestingly the former was a suggestion for the Accra Book Club, but one of the members had given rather negative feedback, so we didn’t add it. I still read it though, and I can see why reactions could be ambivalent. In a way, living in West Africa probably would tend to make me a bit more critical. I liked the different perspectives, but I wasn’t sure that the plot really held together, though some of the individual sections were quite moving. I somewhat resented the ending as being somewhat “colonial”. 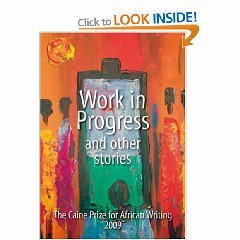 The second work is a collection of short stories, including the five short-listed entries for the 2009 Caine Prize for African writing. I had read a few of the stories before, and also personally know some of the authors of those who attended the 2009 workshop which was held outside Accra in April 2009. So there was definitely an element of curiosity to see what the Ghanaian authors would produce. half century of challenges and progress, and Pierre Bayard’s How to talk about books you haven’t read, both of which were books which I dipped into rather than read at a go, the rest of my reading for December 2009 was what most would call genre reading. There were three crime/thriller novels, one science fiction/fantasy blockbuster and one slim volume which I had been unable to resist buying because it brought back memories of childhood. David Baldacci’s The whole truth: enjoyable and shall I sadly admit forgettable? Stieg Larsson’s The girl who played with fire: the second volume of the Swedish Millennium series. Actually the Accra Book Club is reading the first volume as our January selection, which should be fun. Some reviews were not so positive but I enjoyed this second volume, and the especially the focus on Lisbeth Salander. Last of the crime/thriller trio is Colin Cotterill’s Disco for the departed: Not heavy reading, with some comic elements. Admittedly there was one strand in this book that didn’t relate too much to the main story, but even that was fun, in a slightly macabre sort of way. And finally there was a return to childhood, with a paperback edition of Antoine Saint-Exupery’s The little prince, though regrettably I didn’t buy the colour edition. 😦 I wonder how much I got out of this book as a child, which I am sure I first read in French.